While in some cases you can treat the problem yourself, you should always consider the use of trained personnel. Trained Radon reduction contractors offer their services in many areas. Call your State Radon Office or your local government to locate one. Radon Mitigation - What is it? Radon is a radioactive noble gas that comes from the decay of radium in the soil. Radon is a colorless, odorless, invisible gas that can only be detected through the use of proper equipment and protocols. Chronic exposure to elevated radon levels has been linked to an increased incidence of lung cancer. Radon is a preventable health threat to many New Yorkers. Forty counties of NYS are considered EPA Zone 1 High Risk radon counties. 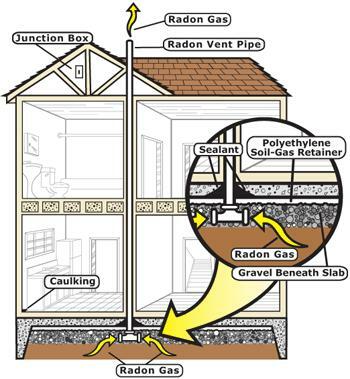 This means that on average, their radon level is greater than the action level of 4.0 picocuries per liter (pCi/L) Fortunately there are effective techniques for mitigating radon in an existing house. When building a new home, radon resistant new construction techniques are more cost effective and efficient at reducing radon. 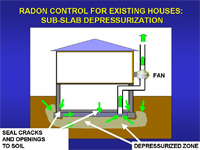 Radon Control for Existing Houses courtesy of National Radon Program Services. Radon Resistant New Construction courtesy of New York State Department of Health. For more information visit www.health.ny.gov section What is Radon Mitigation? Inspection and Radon Testing Information.